Calculations at a right circular cone. The slant height is the distance between tip and base edge, the lateral surface is the surface without the base. The opening angle is the angle at the tip, the base angle is the angle between slant line and base. Enter radius and height and choose the number of decimal places. Then click Calculate. Angles are calculated and displayed in degrees, here you can convert angle units. 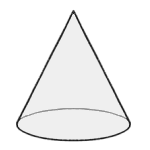 For the calculation of general cones see general pyramid. Radius, height and slant height have the same unit (e.g. meter), surfaces have this unit squared (e.g. square meter), the volume has this unit to the power of three (e.g. cubic meter). A/V has this unit -1.